A historic neighborhood in north central Phoenix. Windsor Square is a 260-home neighborhood, where homes date back more than 80 years. 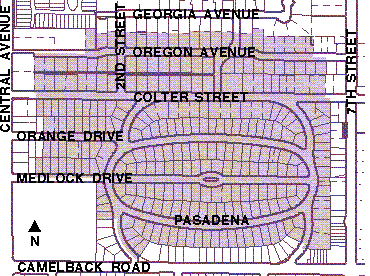 Established in 1929, and bordered by Central Avenue, 7th Street, Pasadena Avenue and Oregon Avenue, the area is noted for its curvy streets and charming homes. It is one of the oldest suburbs of Phoenix, created when the city’s population was just 70,000 and the trolley line ended at Thomas Road. Today, it is recognized for its beautiful historic homes, friendly neighbors, urban vibe, great restaurants and proximity to the light rail. The Board of Directors, which administers the business of the neighborhood, serves the entire Windsor Square Special Planning District. The commercial neighbors make Windsor Square a food-lover’s paradise with a multitude of restaurants only a block away, including Postino, Joyride, The Windsor, and St Francis – and many more just a few blocks away, including Culinary Dropout and Southern Rail. With sweet treats at Churn and AZ Pops, locally crafted beer at SunUp Brewery, and the exciting developments at Uptown Plaza, which will include Shake Shack and Flower Child, Windsor Square is a very special place indeed. The school district is Madison. Click here to visit the Madison school district website. Many houses use SRP’s irrigation system to water their lawns. Visit SRP’s website for more information. The closest light rail stop is at Central and Camelback.